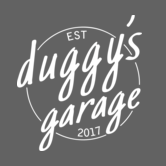 Duggy’s Garage started with my passion for cars, wrenching on Honda Civics in my mom’s garage. The cars were cheap and the cult following was huge! There were a few sport hatchbacks that you could get into and still have a lot of fun with. Eventually this passion evolved into off-road vehicles when a buddy of mine took off-roading. I was instantly hooked. It baffled me to think you would build a rig, go out and make your trucks dirty since I was mainly in the car show circuits where cars were kept pristine and untouched. A complete 180 degrees from my roots.